When it comes to tying the knot, we can always count on Celebrityville to have the grandest, most enviable engagements. Just like in the movies, the stars seal the deal with a sparkling big rock as if to let the world know that they’re bidding singlehood goodbye. Below, some of the local celebs who flaunted their engagement rings on Instagram. Before Miss Jones became Mrs. Rosales, her dashing beau Jericho Rosales popped the question with a round solitaire diamond ring. A symbol of love that suits her name perfectly, Heart’s engagement ring from Sen. Chiz Escudero boasts of a heart-shaped heirloom diamond. What better way to make a queen say yes than with an emerald-cut Harry Winston diamond ring, right? Dingdong Dantes sure knew the right strings to pull. Basketball player JC Intal proposed to Bianca Gonzalez with this precious rock in the middle of NAIA Terminal 2! It may have taken Paul Soriano seven long years to get this 1.5-carat diamond ring on Toni’s finger, but he eventually did—and reportedly, it cost him a staggering P2 million! News broke about Nikki Gil’s engagement when this diamond ring from her non-showbiz fiancé, BJ Albert, made a debut on her Instagram page. 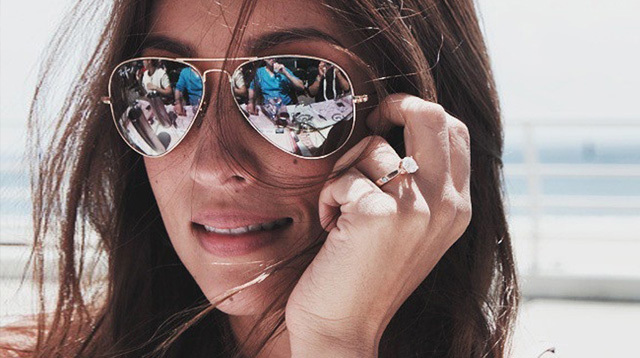 Solenn and her Argentinian beau Nico Bolzico are the type to keep details about their relationship private, but we know an engagement ring when we see one. And that rock? It has “soon to be married” written all over it. Also a lovely bride-to-be, the future Mrs. Sotto showed off her shining, sparkling solitaire diamond engagement ring on Instagram. The recently-engaged Cristalle Belo also sealed the deal with a rock, and a big one at that! Check out her lavish cushion cut diamond ring with halo setting. Any ideas on how you want your future ring to look like?